Hobe Lake Ski Club is slalom water skiing the way it should be for all skill levels, from beginners and recreational enthusiasts to tournament champions. Members ski behind the all-new Ski Nautique 6.2L boat and receive coaching and instruction from professional water skier and 12-time Belgium National Champion, Wim Decree. We’re open to all individuals regardless of skill level. Hobe Lake is a man-made lake designed specifically for slalom water skiing. The lake is oriented north-south and is 2,250 feet long and 260 feet wide. It is surrounded by beautiful natural vegetation and landscaping. Where is Hobe Lake Ski Club? What amenities does the Club provide for skiers? 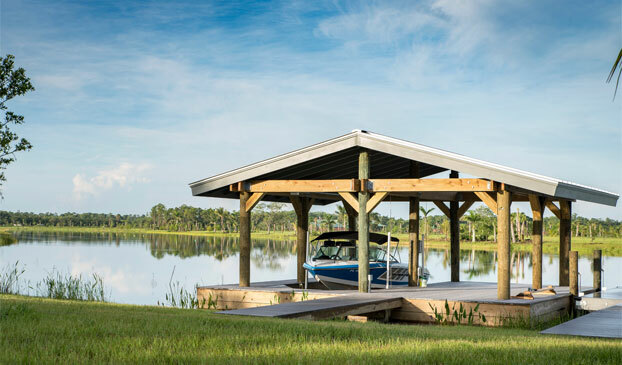 In addition to being totally private and for the exclusive use only of members, the Club provides parking, a large covered viewing area, and a covered dock. When is the ideal skiing season? The weather is mild to warm all year. Winter months are mild and dry, while summer months can be humid and prone to afternoon thunderstorms that are usually short in duration. Our unique location at the top of Florida’s gulfstream make the area ideal for year-round skiing. Why Join Hobe Lake Ski Club? Ski a couple of sets in the morning. Play a round of golf or hit the beach in the afternoon. Explore the cycling and kayaking. All year-long. It doesn’t get any better than this! Have a question about Hobe Lake or the Ski Club? We send only occasional emails that we think our subscribers will like. Every email has a subscription opt-out link. We will never share your subscription contact information.